Instrumented fixation preferred when possible: Instrumented fixation provides immediate strong internal fixation and is the preferred method of fixation where the strength and integrity of the bones permits. Thin bone of the occipital squama, narrow pedicles at C2, or dysplastic lateral masses are commonly encountered in metabolic bone disorders and make screw placement problematic. Screw placement at the craniovertebral junction can be particularly hazardous in the presence of deformity as the vertebral arteries are vulnerable to injury. Wide variety of systems available: A wide array of various internal fixation systems is available, marketed primarily for adult use. Some systems do have small diameter screw options that are suitable for pediatric use. Occipitocervical instrumentation: In this case of Morquio syndrome, a plate is anchored to the occipital bone. The posterior rim of the foramen magnum and the posterior arch of the atlas have been removed. 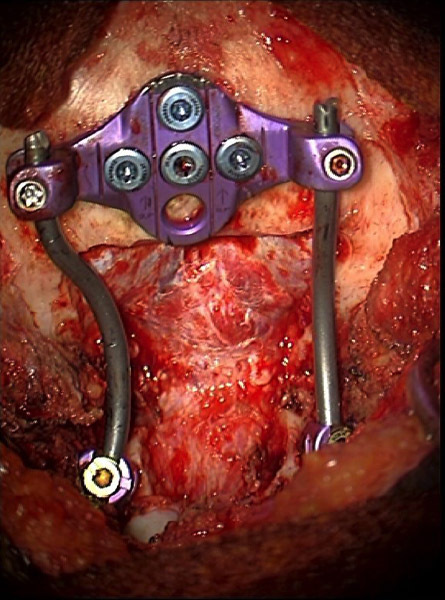 Rods are used to connect the occipital plate to pedicle screws at C2. 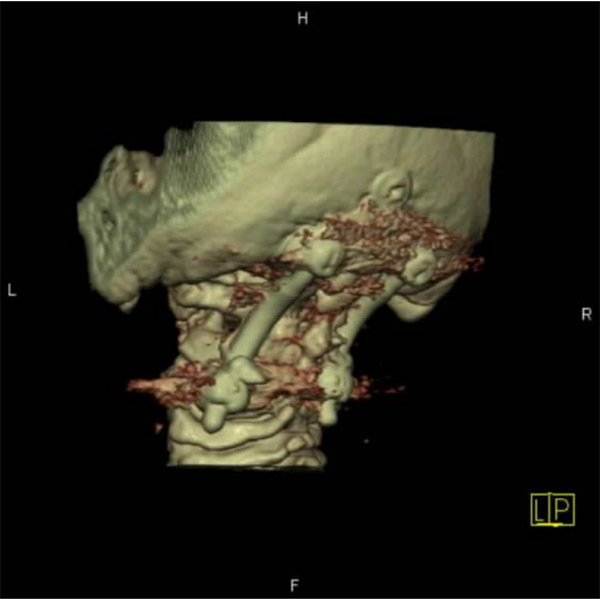 3D CT of occipitocervical instrumentation in a case of Hunter syndrome: Shown is the metal construct and bone graft.